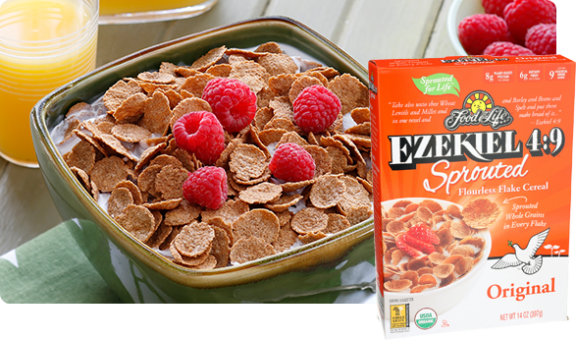 Start your day off right with Ezekiel 4:9 Sprouted Grain Flake Cereal. This cereal has a simple flavor and can be used as a topping for yogurt, ice cream or as a snack. 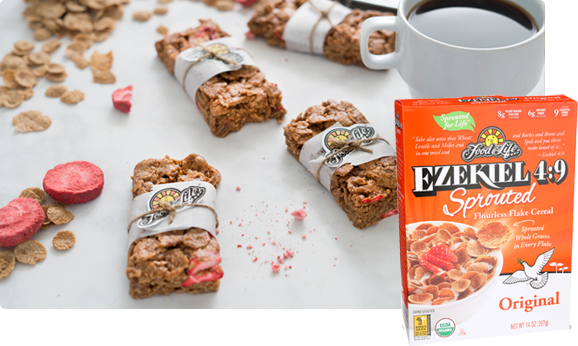 Ezekiel 4:9 blend: (Organic Sprouted Wheat, Organic Sprouted Barley, Organic Sprouted Millet, Organic Sprouted Lentils, Organic Sprouted Soybeans, Organic Sprouted Spelt), Organic Malted Barley, Organic Agave, Sea Salt, Organic Rosemary Extract. FOOD FOR LIFE, FOOD FOR LIFE Sun Logo, EZEKIEL 4:9, GENESIS 1:29, THE LIVE GRAIN DIFFERENCE, SPROUTED FOR LIFE, THE SPROUTED GRAIN DIFFERENCE, CLUCKPHREY, MOOPHREY, PROPHET'S POCKET BREAD, IT'S A NATURAL and THE NEXT LEVEL OF WHOLE GRAINS are registered trademarks owned by Food For Life Baking Co., Inc. The Dove Logo, and Prophet's Pocket Bread are trademarks owned by Food For Life Baking Co., Inc.